Students flock to the Grand Canyon Beverage Co. (GCBC) locations on campus — and we’re not just talking about the students who are customers. Many of them also work there. 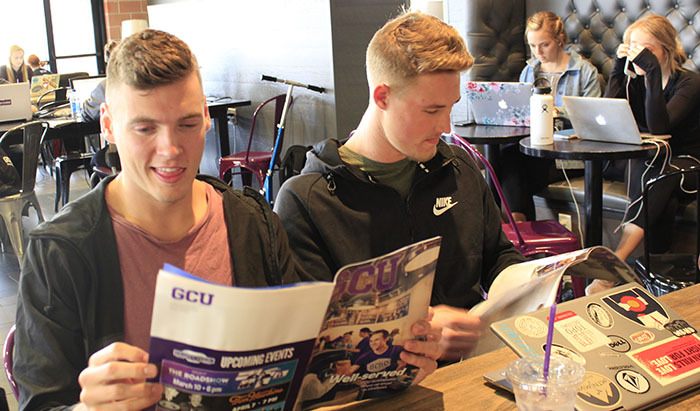 GCBC is the most high profile of the 10 student enterprises that GCU has started in the last three years, a list that includes GCU Hotel, Canyon 49 Grill, the Lope Shop, Canyon Promotions merchandise company, Student Ad Agency and GCU Golf Course. The February issue of GCU Magazine provides an in-depth report of what working at and sometimes managing those businesses has meant to students and recent graduates. Among the other features in this issue are a look at the new Colangelo College of Business Building, Paul Coro‘s touching piece on how beach volleyball coach Kristen Rohr is coping with the death of her husband, and three University programs/initiatives — Academic Excellence Sites, the Parables theatre troupe and how GCU assists students diagnosed with autism. To read the digital version of the magazine, click here.